Home/Science of Sound/Sound/What happens when sound pressures are large? Sources of sound such as airguns, explosives, and electric spark systems can create large underwater sound pressures. In these cases, simple descriptions of sound waves in terms of their frequency, wavelength, and amplitude are no longer adequate. Other phenomena can occur, including harmonic distortion, shock waves, and cavitation. The waveform of a high amplitude sound wave becomes distorted as it travels through the water, because at high amplitudes, sound speed is a function of the magnitude of the pressure associated with the wave. This is in addition to the hydrostatic pressure that is used to calculate sound speed for lower amplitude sound waves. The sound pressure is higher during the compressional phase of the sound wave, and sound therefore travels faster during this part of a high amplitude wave. Conversely, the sound pressure in the medium is lower during the rarefaction phase of the sound wave, and sound travels more slowly. 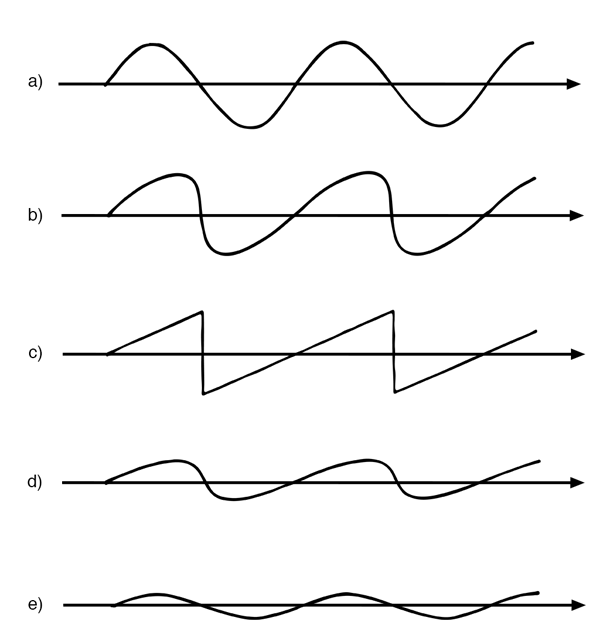 As a result, the sound wave becomes distorted, as shown in the second panel of the figure below. The distorted waves contain energy not only at the frequency of the original sound wave (fundamental frequency) but also at twice the original frequency (second harmonic), three times the original frequency (third harmonic), and so on. This behavior is therefore referred to as harmonic distortion. The transfer of energy from the fundamental frequency to the harmonics limits the amount of energy that a sound source can transmit into the ocean. Stages of an intense sound wave propagating away from a source. (a) The pressure signal close to an intense source. (b) The distorted signal after propagation away from the source. (c) Fully developed repeated shock wave (sawtooth wave) away from the source. (d) Aging repeated shock wave after loss of the higher-frequency components. (e) Small amplitude of a former shock wave. Adapted from Medwin and Clay, 1998. If the amplitude is high enough, the sound wave eventually takes on a sawtooth form as it propagates away from the source. This is shown in the third panel in the figure, with nearly instantaneous increases in pressure or shock waves occurring once per cycle of the original sound wave. The higher frequencies are more rapidly absorbed in seawater, however, and the sawtooth waveform will therefore decay back to a simple, weaker sound wave at greater distances from the source, as shown in the final two panels of the figure. Shock waves can be generated by harmonic distortion of high amplitude sound waves, as described above. Underwater explosions also generate shock waves. An underwater explosion of a material such as TNT (trinitrotoluene) starts with an extremely rapid chemical reaction that creates hot gases at temperatures of about 3000°C and pressures of about 50,000 atmospheres. The pressure at the gas-water interface causes the water to move outward at speeds greater than the speed of sound in seawater, creating a shock wave. 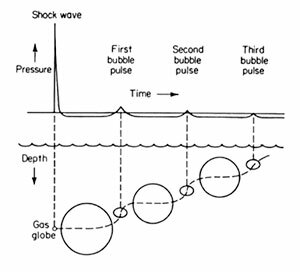 The shock wave generated by an underwater chemical explosion consists of a nearly instantaneous increase in pressure, which then rapidly decays. The shock wave propagates at speeds greater than the usual speed of sound in seawater of about 1500 m/s. The hot gases also create a large, oscillating gas bubble, unless the explosion is so close to the surface that the bubble gases vent to the atmosphere. A video of explosions in an underwater test tank. Video curtesy MITvideo – video.mit.edu. Explosives are used for many purposes, including underwater oil and gas exploration and development, underwater construction and demolition, acoustic propagation research, geological research, and military purposes. In addition to explosive materials such as TNT, there are explosive-like systems, such as airguns and electric spark systems, that also generate shock waves. 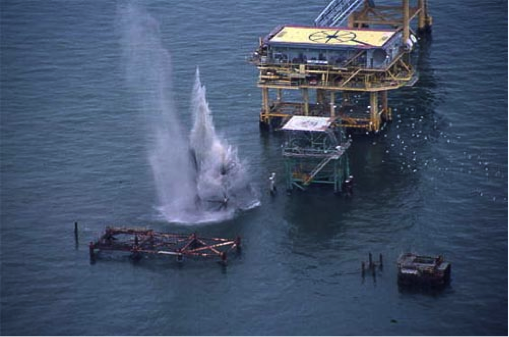 Underwater explosives are used in oil and gas platform removal activities. Image credit: NOAA. In an explosive shock wave, the extreme overpressure and rapid decrease to below ambient pressure can cause injuries if the pressures exceed the dynamic range of tissues. At longer distances, the shock wave dissipates and becomes a sound wave, which will have insufficient energy to produce significant traumatic injury. When the sound pressure in the low pressure phase of the sound wave becomes low enough, the medium through which the sound is traveling ruptures or cavitates. The low pressure puts the medium in tension, generating bubbles. Bubbles produce sound when they collapse. They also absorb sound energy propagating through them. The precise value at which the medium ruptures depends on the frequency, duration, and repetition rate of the sound pulses. The effect of an increased source depth is to increase the peak pressures required to cause cavitation by the amount of the ambient background pressure. High-speed image recording (13500 fps) of the snapping shrimp in side view.Video courtesy of Department of Applied Physics, University of Twente. Cavitation bubbles can also be produced by the decrease in pressure at the blade tips of high-speed underwater propellers. The propellers on submarines at depth can rotate faster without producing cavitation. Therefore, submarines can go fast at depth while remaining quiet. Cavitation sets an important limit on the source level of acoustic sources at shallow depths. Any attempt to increase the sound pressure above the ambient pressure will generate a cloud of bubbles that will cause the signal to become distorted and actually decrease the acoustic pressure away from the source. Acoustic cavitation can initiate or increase chemical activity. It can erode metals and plastics. Most remarkably, cavitation may produce light (sonoluminescence).